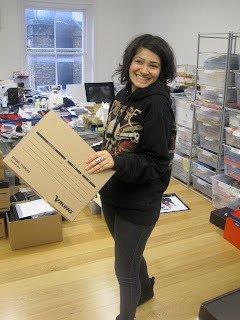 The team spent most of last week packing everything up ready to move. Halimah and I found a great moodboard of the original concept for Sirens. This was our first ever collection, for Spring Summer 2009 and was created in association with the artists on our Selfridges London counter. So, it’s onwards and upwards in terms of actual office. We now have the most fabulous office. It has a bright pink wall [a source of hot debate between the male and female members of the Illamasqua team] and huge images of our past and future collections. … and a fabulous area for the Product Development team.